Avda.Venecia S/N, 40424 Angeles De San Rafael, Spanien. 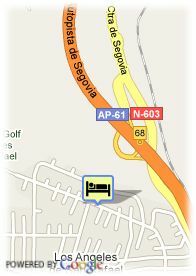 Quiet hotel in Segovia and close to Madrid. 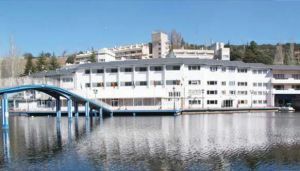 The Nayade Hotel is located in the exclusive Los Angeles de San Rafael estate, fully in the Sierra de Guadarrama, next to a bay and surrounded by mountains and vegetation. This privileged location allows the clients to enjoy the lush nature which surrounds it. And this all, at just 40 minutes from Madrid center. Restaurant, large gardens, elegant lounges and swimming pools, all the facilities of the Nayade Hotel are conceived in order to offer a unique and unforgettable time for its guests. Its rooms are big and comfortable. All of them have the last services such as mini bar, + Channel, telephone and background music, among others. Furthermore, the Nayade Hotel is perfect to celebrate working reunions, conventions and seminaries and its large and equipped lounges bring a quiet atmosphere. Gymnasium, tennis, horse riding and varied water activities give to its guests the possibility to relax them after the working time in a privileged place, totally in the Sierra de Guadarrama of Segovia. ältere Kinder und Erwachsene: 22.50 € pro zusätzliches Bett.